Chevy Chase Village Police Chief Roy Gordon has requested that the Village spend $30,000 in speed camera revenue to purchase 12 Tasers. 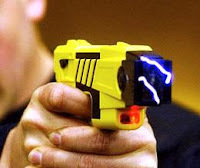 Tasers are considered 'less lethal' alternatives to firearms since the ir use by police has resulted in only about 148 deaths since 1999[ref]. Legally, speed camera funds are supposed to be limited to Public Safety expenditures. Chevy Chase Village has thus far included Cable TV lines, a new office for their police chief, a Segway, and energy saver lightbulbs in the 'public safety' category. CouncilMember Phil Andrews stated his opposition to the Taser proposal, "I think the public would prefer to see speed camera revenues directly related to traffic safety." However the reality is that very little of Montgomery County's own speed camera funds have been spent on such purposes, instead being spent on items already planned in the County budget. In early 2009 Councilmember Andrews admitted in a council session that "There's not a way to specifically account for how the money is being spent. It goes into the General Fund." Neither the Chevy Chase Village budget nor the County's list of expenditures in its OLO report reveal significant amounts of speed camera funds spent on other types of traffic calming devices, which have been shown to be more effective at reducing average speeds than speed cameras. Since the Village doesn't wish to invest in such devices, perhaps the sight of taser weilding police will reduce accidents?